Until now, spray gun is still considered as the important equipment to apply the finishing material. The fact is spray gun as the equipment to apply finishing material gives the perfect results. When it is used, the spray gun is doing two functions at once time; atomize the finishing material and direct the material to the desired surface. Those make the spray gun give the most even and smooth surface and the highest flexibility in application. With the proper setting and handling the spray gun can layer finishing material to the desired surface with the desired thickness with the even and smooth surface. Since it was introduced in the wood finishing industry in the late 19th century until today, there are lot of developments has been made to the spray gun. Currently the equipment industry has provided spray gun with many types with its accessories to supply the wood finishing industry. It makes the finishing industry players have high flexibility to choose the tools according to its needs. But to be able to maximize the benefit from the equipment, we need to have knowledge about the each types of spray gun with each advantages and disadvantages. According to its atomization method, the spray gun can be divided into 4 types: air spray, HVLP, LVLP, airless and air mixed spray gun.. It is the type of spray gun spray gun that was first discovered and used to the wood finishing application. In the air spray gun, the compressed air is flowed into the nozzle to be mixed with the finishing material and atomize the finishing material. (See our previous article: air spray gun). With air spray gun, the operator has maximum control the application of the finishing materials with the best layered result. Air spray gun is equipped with screw to adjust the pressure and volume of compressed air, the screw to adjust the material volume. The spray gun also has the rotatable cap, and the screw to adjust the width of the spreading spray. By rotate the cap and adjust the screw we can adjust the direction and the width of the spray. Thus the operator has maximum control to adjust the air pressure, width and direction of the spray and coating thickness of finishing materials. In the skilled operator the spray gun is the best tool to apply of finishing materials with perfect results. The biggest disadvantage of the air spray gun is its low efficiency. The transfer material efficiency of the spray gun is ranged between 30% - 60%. The air spray gun will create dust spray as material lost in the air. The dust spray is related to the air pressure; more air pressure will create more dust spray and finally will lower the efficiency material transfer. The pressure of the air to operate the air spray normally is around 3-5 bar (44 – 73 psi), depending on the viscosity of the material applied. To obtain maximum results, the air pressure of the spray gun must be set at the lowest air pressure but could produce a perfect atomization. The quality and efficiency of the coating is dependent operators who run the spray gun. At the work with a large volume then we must consider that the operators could be tired and tend to lead the unstable operation and then the results can be unstable as well. Spray gun HVLP (high volume low pressure) is a modification of air spray gun to improve the efficiency of the material. HVLP spray gun is able to produce a perfect atomization with low air pressure. To increase the maximum efficiency then the air pressure in HVLP spray gun is set at about 14.7 psi (or less). Then to improve the atomization process, the higher volume compressed air is flowed into the nozzle. With the proper setting, the HVLP spray gun can improve the efficiency the material transfer to the maximum level (60% -70%). The disadvantage of this tool is the slow work speed and the limitation to the viscosity of the material. In the wood finishing is most used for stain and glaze application. Some people also use the HVLP spray gun for application of sealer, top coat, base coat or primer, but limited to the low viscosity. LVLP (low volume low pressure) spray gun is a further development of the HVLP spray gun and air spray gun. This tool works with the same system with air spray and HVLP spray gun but it is designed to be able to work with low air pressure and low volume of compressed air. LVLP spray gun can work with low air pressure as well as HVLP but with a low volume compressed air as well as air spray gun. This LVLP spray gun even can work to the material with higher viscosity than the HVLP spray gun, then it can be used for the application of sealer, top coat and base coat instead of stain and glaze application. But it cannot produce atomization as good as the air spray and HVLP spray gun, then it is not suitable for the application for the top coat that need perfect quality layer. LVLP spray gun is also not well suited to work with a large volume due to his low work speed. The airless spray gun uses a different atomization method then the air spray. At airless spray gun the finishing material is pressed and then passing it through a small hole (orifice) to make the atomization. The high pressure is needed, up to 1000 psi (68 atm.). The airless spray gun need high-pressure pump and strong material hose to withstand the high pressure. The airless spray gun gives higher efficiency material transfer (up to about 70%). This tool is able to be used for applications material with higher viscosity materials and gives high-speed processing. This tool can produce a thicker coating material with less movement than the air spray gun. The disadvantages are his less atomization quality and flexibility. This airless does not have adjustment to regulate the air pressure and the width of spray. Limited settings can only be done on setting the width and direction of the spray fan make this tool is not suitable for the application of stain and materials that need fully application control. The airless spray gun is mostly used to apply: base coat, sealer or first top coat which is followed by sanding operation and the next coating application. Air-assisted airless (air mixed) spray gun. The air mixed spray gun is the modification of the airless spray gun where the material atomization process is assisted by flowing the compressed air to the spray gun. When the finishing material passes through the orifice and being atomized then the compressed air that is flowed to be mixed with the atomized material out of the orifice. With this method the tool gives better atomization than airless spray gun, although not as good as the air spray. Therefore, the air assisted airless spray gun is more widely used in furniture finishing industry. It can be used to apply the top coat with quite good result. The disadvantage of the airless air mixed spray gun is his less flexibility than with air spray gun. It gives high speed, then it more suitable to do the high volume work with higher consistency. 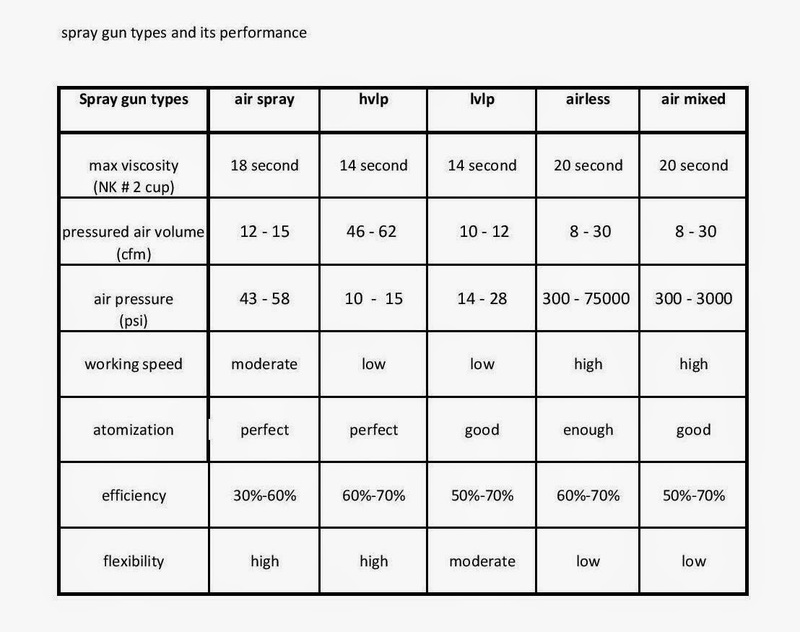 To simplify compare the performance of the various types of spray gun we can see at the table below.